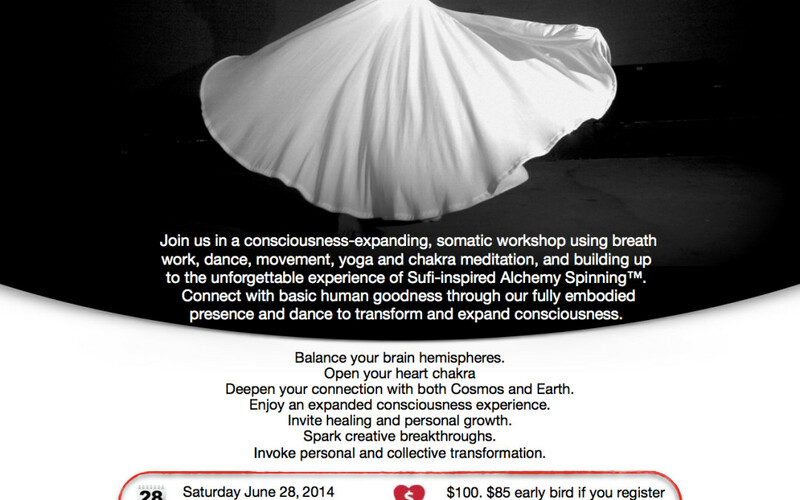 Discover the power of whirling with Alchemy Spinning™ at Destiny Arts Center on June 28th, 2014. Join us in a consciousness-expanding, somatic workshop using breath work, dance, movement, yoga and chakra meditation, and building up to the unforgettable experience of Sufi-inspired Alchemy Spinning™. Alchemy Spinning™ was created by dancer/healer Raquel Santiago, who found inspiration in the movements of energy around the chakras, the spinning of planets and the cosmos, and the hypnotic whirling of Sufi dervishes. This introductory Alchemy Spinning™ workshop is geared towards connecting with basic human goodness through our fully embodied presence and dancing to transform and expand consciousness. Open to any person of any age and fitness level. No previous dance experience is necessary. Price: $100 full rate. $85 early bird if you registered before June 18. Space limited. Buy a ticket and register now.